With the fine weather and the holiday season upon us our band of Jersey Joggers has become rather thin. Five of us set out this morning in the north-west of the Island, in the parish of St Ouen about which I’ve written in the past. 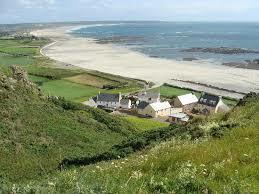 Insofar as you can find isolation on a 9 x 5 mile island St Ouen provides it. Times past there were folk that never travelled from here to the bright lights of the capital, St Helier, let alone further abroad. And today in an hour we barely saw a soul. The land hereabouts rises from the sea up an escarpment to the higher ground on which lies rich farmland. One way up the escarpment is to take one of the well-hidden ‘donkey tracks’ and this is what we did this morning. Steep and sandy, one is soon rewarded when, puffing and hands on hips, the high ground is reached and St Ouen’s Bay glistens behind you in the morning sun. Another barely-used trail follows. One wonders just how old these sandy trails are and for what purpose they were used in years gone by. Even when one reaches the tarmacked lanes there is little sign of life, just the odd cow or horse startled to see gaily-coloured, sweaty strangers. Lore has it that you need to show your passport at the parish border and it wouldn’t surprise me at all if an old farmer jumped out and demanded we do just that. Back down the quiet lanes to sea level after a life-affirming few miles. There is an archaeological fortnight going on and in the late afternoon I took the opportunity to join a guided visit to this well-known site. Well-known but infrequently visited as you need the agility of a goat to access it at low tide across a boulder-strewn beach and and a rocky climb to the site itself. Kudos to the (even older) folk that gallantly struggled and conquered. 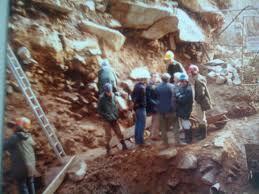 La Cotte, we knew, is one of the most important archaeological sites in northern Europe. It has yielded thousands of finds that evidence occupation by Neanderthal Man from 250,000 years ago, up to when the Neanderthals were replaced by modern man. It was fascinating to have two eminent archaeologists familiar with the site to put it all into context – the way successive ‘cold’ and ‘warm’ periods affected the sea level and therefore the mineral deposits and erosion. The layers of sediment, clearly seen, were explained as was the history of excavation at the site. Despite the importance of the place there remains much which remains to be done. Also there is need of a plan to protect what has been exposed over the years. Sadly the experts debunked one myth, hereunto held true by every Jersey child. Although mammoth remains have been found in profusion they were not driven over the cliff to their doom. Rather they were hunted on the lowlands at a period where the sea level was much lower. Truly I live in a wonderful place. You do live in a wonderful place, Roy. Hope I can visit it someday. Indeed, you do, Roy. A lot of beauty and drama packaged into a few square miles. It’s true Fran. You have your vast panoramas and big country while Jersey has something of interest around every bend. Hi Jill – it’s so true and I’ve no time for the moaners here that can’t see past the end of their noses. It’s lovely to read about Jersey through your blog and your books, Roy. I would have had no notion otherwise, that it is indeed, such a fascinating place. Thank you RH. Jersey sure punches above its weight in many respects. It’s mad that I’m still seeing new parts of it after 37 years. Roy, you’ve done it again ~ made me feel all ‘homesick’ ~ for Jersey. It’ll be 23 years this September that I first set foot on it. Great place for a honeymoon! Jean, back in the day Jersey was mobbed with honeymooners in the spring & early summer. The tax advantage of marrying before 5th April made Jersey a very cheap deal. I don’t know where you stayed but the Merton Hotel used to specialise in honeymoons! Those were the days, with cabarets everywhere, the West Park Pavilion (apartments now) for big dance nights etc. That’s all changed of course and you’d find the attractions, nightlife etc mostly gone. On the plus side the Island is not so crowded and hectic during the summer months. Roy, Jersey sounds perfect for my kind of honeymoon now! It was nice and quiet in late September in 1991 and I can assure you that I was never into the cabarets or big dance nights! Sandy beaches and leafy lanes for me, please, and Jersey certainly serves them up wonderfully. Mammoths and donkeys and the potential passport check: now that sounds like a good walk! Indeed it is Letizia but so many of our residents seem to be blind to Jersey’s quirks and offbeat characteristics. I wish people would open their eyes and take time out from their daily routines and appreciate what’s all around. I’ve learned so much about your beloved Jersey from your blog, Roy, before which I’d never even heard of the place! I’ll definitely have to make a stop there on my next trip to England and the Continent. Hey Dianne, oh there’s no end of digs here – never mind La Cotte which is only the jewel in the crown. There’s one going on just a mile or so up the road from me in what was thought to be just another old field! Clearly people fancied living here long before us.